Up until 2003, there was no American, or English, website dedicated to the artwork of Bill Wall Leather. 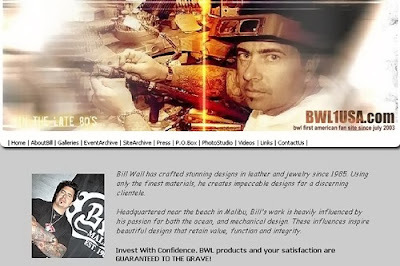 The Bill Wall Leather First American Fansite (BWL1USA.com) was created in July 2003 by Slava. 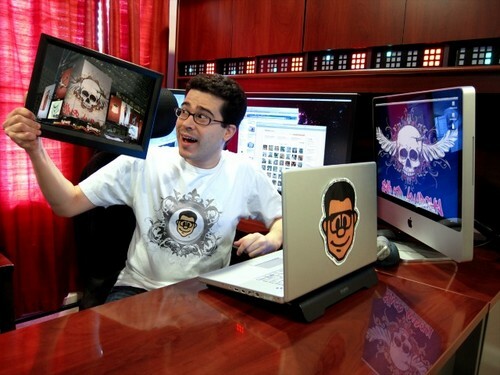 He is also the owner and operator of SilverAnarchy.com. It is dedicated to silver jewelry enthusiasts worldwide and has an amazing online forum filled with valuable insight, photos and information. Via Silver Anarchy, silver enthusiasts and aficionados all over the world get to experience a side of this industry, behind the scenes, without advertising and commercials. 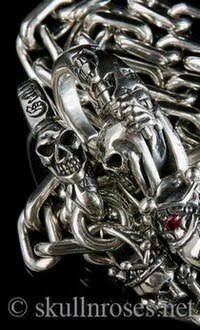 Mr Skull N Roses is also big fan of Silver Anarchy and very proud to interview Slava, one of the top-ranking silver jewelry experts (in our field) of the decade! Interview with the Man Behind Silver Anarchy! 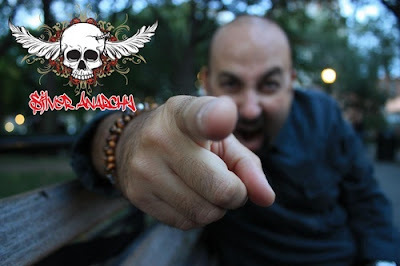 Mr Skull N Roses: Slava, thank you for this interview! Literally, a person can spend hours, even days, just looking over your website and forum. When I first discovered your website, a few years ago, I thought that I struck black gold, like Jed of the "The Beverly Hillbillies" show. Your website is like an online treasure chest filled with beautiful silver jewelry, and the Silver Anarchy forum and community gave me answers to questions that I wanted to know as a silver fan. Mr Skull N Roses: Can you tell our readers where you are from and a little about yourself? Are you an artist as well? Slava (Silver Anarchy): Thank you Mr. Skull N Roses for having me. I was looking forward to this interview for quite some time and appreciate your love and support; it means big deal to me. Well, I never enjoyed talking about myself, so I will be short on this subject. My family and I came to the States from Russia in 1995 when I was only 22 years old. Nothing was too easy for me in the beginning. New culture, new language, new food... everything was new; I had to start all over again. But I had my personal reasons for why I came here and knew what I had to do. I was young, strong-minded and was willing to do pretty much anything to support myself and my family. I went and finished my second college degree in 1998 (the first was Higher Military School back in Russia), majoring in computer science, learned the language, studied American culture, etc. Since then, I worked for some of the top computer technology oriented companies in the industry, like DFC and IBM. I'm married to my beautiful wife, Olga, and we have one daughter, Mariya, who's turning 18 in November. Currently my family and I live in New York. Even though my backgrounds were in military and computer science education, which seem far related to the arts, I was always a very artistic person by nature. When I was just 16 years old, I finished a local art school oriented in glass mosaics and was working alongside with experienced artists decorating bars, halls and local churches. I could draw very well and loved to work with smaller projects. Many will find it strange of me saying this, but the love for jewelry came to me much later, even though I had many friends who were well known jewelry artists. 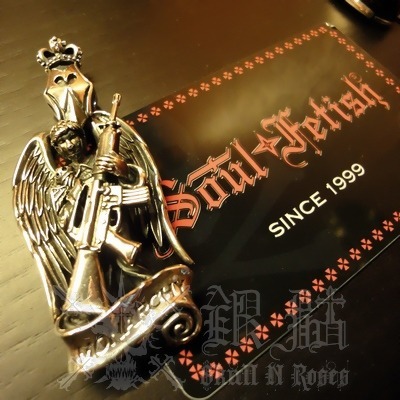 Mr Skull N Roses: How did your love for silver jewelry, or any jewelry for that matter, start? 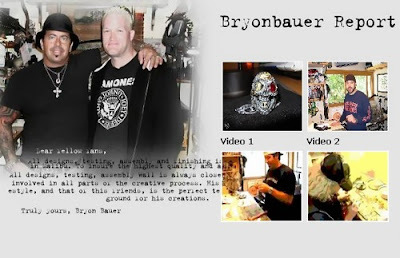 Slava (Silver Anarchy): Wow, I remember this one exactly...I was over at my friend's house, who was a jewelry artist, and I was watching him work on a ring someone ordered, and it completely blew my mind the way he did it. I was so fascinated with the process and could not take my eyes off the piece taking up shape. That was my very first experience with hand-made jewelry. I could not even look or ever considered buying anything machine-made, since then. This was something I wanted to know more about, and I started looking for the information on the process and the artists working in this field. 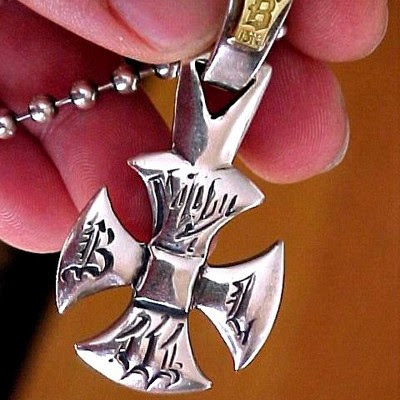 That's how I came across jewelry made by Bill Wall and his company, Bill Wall Leather. 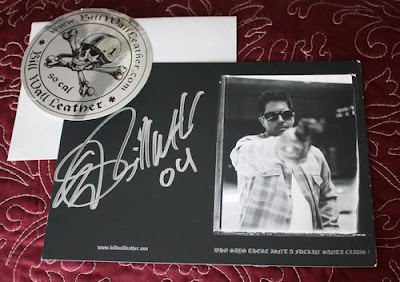 Mr Skull N Roses: What lead to the development of the Bill Wall First American Fansite and Silver Anarchy? Slava (Silver Anarchy): It was a love from first sight. I can talk hours about Bill Wall, the person and the artist, and one interview just won't be enough for this. Besides, I wouldn't want to repeat everything already said by me in the introduction section on BWL1USA.com. My passion for Bill Wall's art came like a storm on a sunny day, unexpected, strong and has never lost its power in me since 2003. My first BWL piece was Good Luck Skull ring, which I purchased directly from Bill and the minute I put it on my finger, I knew this was a start of something big for me. I was stoked with the way it looked and felt, the details of the ring took my breath away. It was as pure magic to me as I had never seen anything quite like that before. When I could finally catch my breath, I called Bill to thank him and what meant to be only a few minutes of chat, turned into an almost hour long conversation. Bill Wall is such a great person and was so easy to talk to that almost instantly I felt like I knew this guy forever. Bill takes extreme pride in what he does; his flow of creativity is unstoppable. The strive for making things better is a way of life for him and his loyalty to his fans is undoubtable. I felt that in every conversation we ever had since then. Bill and I developed this invisible bond and friendship almost instantly and it only grew up stronger with every year. I wanted to know more about the guy and his art and did some research on the web. To my big surprise, the only website that I found in the English language was the BWL official web site, with some generic information about the artist and his brand. I thought it wasn't right and felt I had to do something about it. I wanted the whole world to know about this amazing artist and his art. My knowledge of computers came very handy so I started working on his fan site. I called it BWL1USA "First American BWL Fan Site" which launched on July 1, 2003. It started off as a few simple pages worth with some basic information and photos, but I knew it would grow up with time. I start gathering information, photos, videos from everywhere I could. Two guys Derek and Bryon came to the rescue. They had access to Bill's shop and voluntarily helped me out with photos and info. That's how the Darekend and Bryonbauer Report were born. Some of you may still remember weekly updates by these two BWL1USA special correspondents who were providing us with priceless information and photos about the brand and the artist. BWL1USA.com, today, is a child that we grew up with together, and I'd like to use this chance to thank all BWL fans and supporters around the world who were helping me during all these years to put the site together. Without you guys, it would not have be possible or made much sense. BWL1USA is a dedication to Bill for this incredible art and amazing talent, my gift to Bill's fans for their love and support and a history piece to future generations of BWL fanatics and silver enthusiasts. It wasn't until 2007 when I felt an importance of having my other web site SilverAnarchy.com. It started off as a small and very simple online web store with some designer jewelry that I collected over the years but wanted to part with. The truth is, being BWL #1 fan, I never really stopped educating myself in this field or could resist experiencing other designers' art. Many argue over me for "cheating" on BWL for doing so, but I never felt that way and Bill Wall never doubted my loyalty to his art. All I wanted to know was more about silver jewelry, other artists and their techniques. Thanks to my, then, good paying job I could afford to buy lots of silver from many designers and decide for myself whether I liked it or not, and know the difference between bad, good and better. Eventually I got to the point when my personal silver collection grew up so big that I felt an importance of unloading some of my stuff and make room for new pieces. That's how SilverAnarchy.com was born. I was (and still am) in touch with many wonderful artists and loved educating myself on their unique styles and techniques. So it didn't take too long for me to realize that besides selling my personal stuff, I could do something else with my website, and decided to showcase jewelry of the artists that I liked on there as well. It actually turned out to be such a great idea to get top silversmiths under one roof that I often get emails from the people thanking me for such easy one-stop silver shopping. Even better, now you can custom order any piece of jewelry which will be specially made for you by one of those designers in no time. The option never available before for the reason being that not too many jewelry artists, who work in this style, take orders from the general public. I've been constantly working on updating my site pages with new products, trying to add more new talented artists, making it even more interesting, informative and easy to use. Recently my internal page hit counter hit recording 475 visitors for that day and that tells me I've been doing something right. Mr Skull N Roses: I am one of those happy customers! Folks, check out the piece (above - Monarchy angel pendant designed by Thierry Martino) that we purchased from Silver Anarchy. How do feel about the Silver Anarchy forum? Just about every designer has been on it...it's pretty amazing. 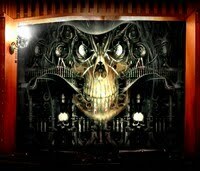 Slava (Silver Anarchy): Yes, thank you Mr Skull N Roses, amazing indeed! 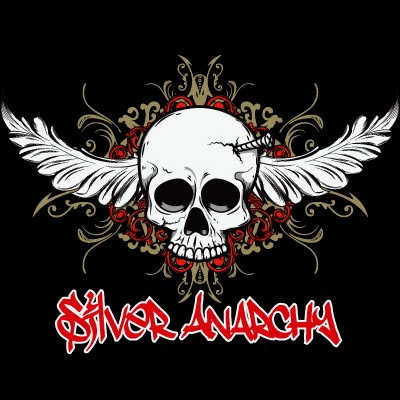 The SilverAnarchy forum is a favorite hang out place for many fans and artist alike. For fans to get the most recent updates in the silver world, or to express their feelings and thought about a particular piece of jewelry or design; for artists to introduce themselves and their art to wider audience. I'd like to invite everyone interested in silver jewelry to visit our forum and to participate in any conversation, you may find it an interesting and informative ride. Mr Skull N Roses: You have a big collection of knives! We also see some beautiful knives on your website for sale. Is this your second passion...can you tell us about it? Slava (Silver Anarchy): Ah knives.... well, don't like talking about it much but since you brought up the subject...Always liked knives and learned to treat them with respect. Never looked at it as a violent tool or anything like that since a piece of wood or an ordinary rock can be used for violence, too. It all depends on who's hand holds it and how it's been used. I don't have a big collection of knives and trying to be very selective when it comes to buying a new knife. My passion for knives has shifted so many times that it took me about 5 years, or even more, before I could decide for myself what particular type of the knives I liked the most and wanted to continue collecting. My most recent passion is for tactical military knives by Mick Strider. I got one about 3 years ago and was stoked with its look and performance. Since then, constantly looking for and searching to add a new one to my collection. 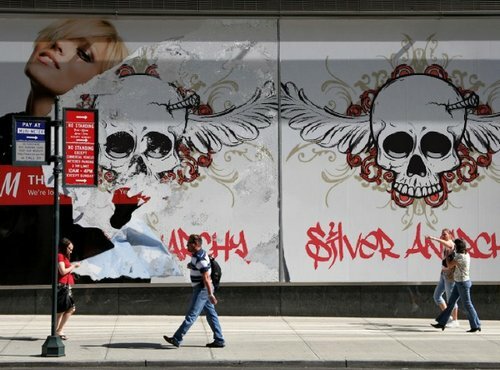 Mr Skull N Roses: Silver Anarchy is advertisement free! The site has tens of thousands of visitors monthly...what can they do to support the website and your charitable causes? Slava (Silver Anarchy): As to advertisement, I made a choice to have my website advertisement free, a long time ago, and trying very hard to keep it that way. I have had hundreds of proposals and money offerings but chose to refuse them all. All except for one that I currently have at the bottom of both my websites, I voluntarily posted on there and is 100% FREE, for The Humane Society of the United States, being a huge supporter of anything to do with helping and protecting animals, especially dogs and cats. So if any of you have a heart for animals and a few extra dollars to spare, please go to that website and donate whatever you can. No money is too little, anything helps. Their web site address is www.HSUS.org. 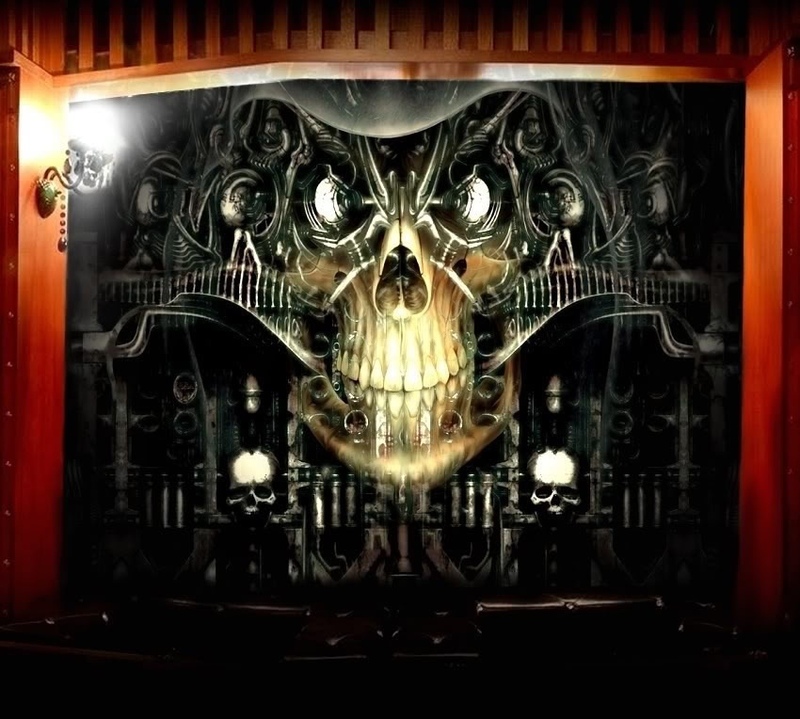 Mr Skull N Roses: Any people that you want to thank or mention about to our readers? Slava (Silver Anarchy): I've been into silver jewelry for over 10 years now and obviously, with time, developed quite a large circle of people that I've been constantly communicating with, talented artists, loyal customers, personal friends and site supporters. If I wanted to thank all of them in this interview would consist only of their names, they all very important to me. Without mentioning any particular names, may I just say Thank You to all these people, for their love, trust and support. They all know who they are. God Bless! Mr Skull N Roses: Thank you, Slava, for this wonderful chat and we hope to see more great work on Silver Anarchy! Your website has enriched the minds of silver fans all over! 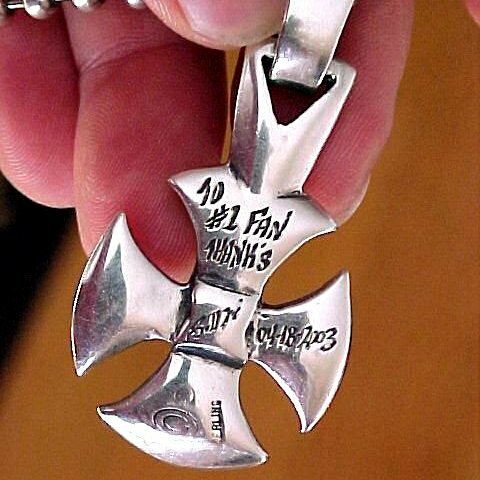 For our readers, some jewelry pieces on the Silver Anarchy site are rare and difficult to find collector's items. Go now and get them while you can!